Ivy Leaguers have arrived in Boston for their final meet of the indoor season — this weekend’s ECAC and IC4A championships at Boston University. The regional championships kicked off Friday with the pentathlon and Day 1 of the heptathlon (although, no Ivy competed in either event) and conclude on Sunday. A full meet schedule is available here. Live results with entries are available through LancerTiming.com. But the Heps Nation has a very little presence at the IC4A and ECAC Championships. The standouts to watch on the men’s side are Brown junior Tosin Oyewole, the runner-up in the 400 at Indoor Heps; Harvard sophomore Myles Marshall, the Indoor Heps 800 champion who will be running the 500 this weekend; and Yale junior Paedyn Gomes, the Heps 60 hurdles champion. For the women, the 200 will feature both Columbia junior Akua Obeng-Akrofi, who won the 400 at Indoor Heps; and Cornell junior Adrian Jones, who was disqualified in the 200 final at Heps after running out of lane before finishing in a speedy 23.68. Can she post a legal historically low time? Also for the women will be Heps 800 champion, Shannon Hugard, a junior at Cornell who will be running the 1k at ECACs, and Columbia senior Anna Williams, who will compete in the long jump after winning the Heps triple jump last week. 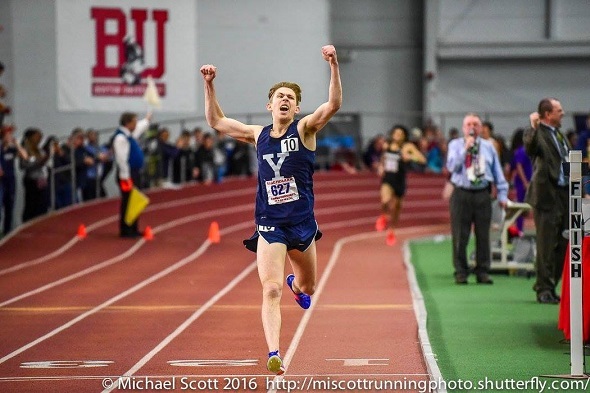 Last year, Yale swept the regional titles in the mile. James Randon broke the mystical four-minute barrier in the mile to set a new meet record in 3:58.85 (the photo above was from this meet last year), while Meredith Rizzo won in 4:44.11 with a well-time lean. Meanwhile, Cornell’s Bobby Plummer won the 2016 IC4A triple jump title with a distance of 50-1 1/4. Columbia graduate Iris Chijioke won the 60m hurdles in 8.64. This entry was posted on Friday, March 3rd, 2017 at 3:09 pm. It is filed under Athletes, Spotlight. You can follow any responses to this entry through the RSS 2.0 feed.